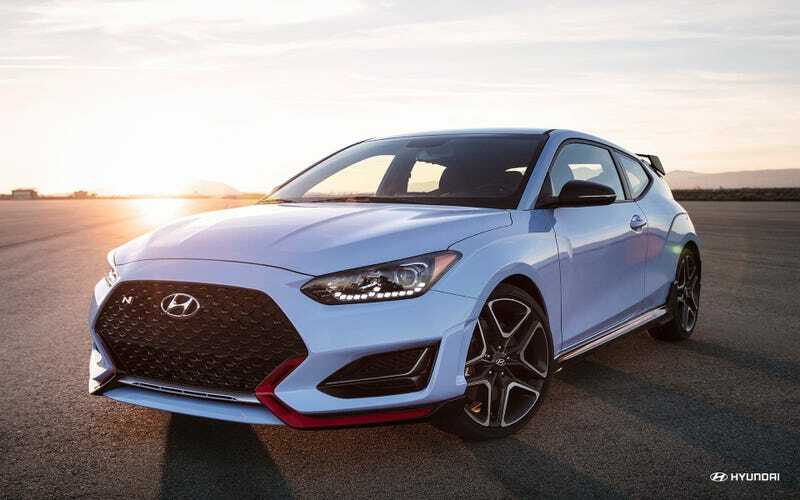 Hyundai finally jumped into the hot hatch game (the first gen Veloster Turbo was lukewarm) with the long awaited Veloster N. Here’s the price breakdown. There are 4 exterior color choices: Chalk White, Performance Blue, Racing Red, Phantom Black. One interior color choice is available as well. Black of course. All exterior colors, save for Racing Red, come with the lower front and sides of the car trimmed in red.. All colors are no cost options of course. I do wish red was interior color option as well. 13.5” front and 12.3” rear ventilated brakes. There are only 3 accessories as well: wheel locks, a cargo tray and rear bumper applique. I added none of these. All in, a Veloster N will set you back just under $30 grand. $29,885. At this price, it outpowers the GTi both with and with and without the Performance Package and actually closes in on the WRX power wise. This thing should be a performance steal.